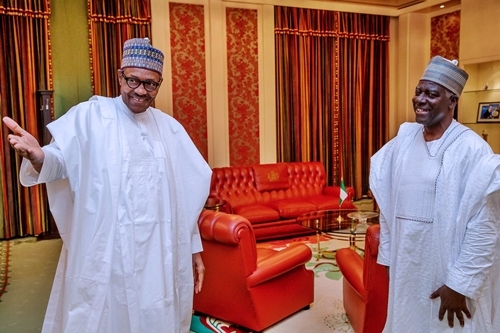 President Muhammadu Buhari on Thursday in Abuja met, for the first time, with the newly appointed Director-General of the Department of State Services, Yusuf Magaji Bichi, at the Presidential Villa, Abuja. When Bichi was ushered into the president’s office by protocol officials, he was asked by the president if they had met before. The new DG, however, 'confessed’ that he was seeing President Buhari face-to-face for the first time in his life. The meeting of the president and DSS boss went into a closed door session. President Buhari on Sept. 13 appointed Bichi, as new Director-General of the Department of State Service (DSS). Bichi had undergone training in intelligence processing analysis, agent handling recruitment and intelligence processing in the UK, as well as strategic training at the National Defence College.